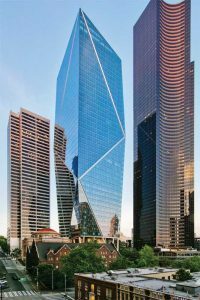 The magazine’s series of sponsored e-books continues with a look at the Mark, a 48-story, mixed-use tower in downtown Seattle. The owner and developer held the rights to demolish a historically significant church on the site, allowing for the development of a half-block footprint. However, the emotional, cultural, and also historic significance of the old church motivated the client and local parishioners to seek alternatives. Working closely with Daniels Real Estate, ZGF Architects looked at numerous design configurations to preserve and celebrate the downtown site while developing a contemporary office building. Ultimately, the church’s preservation and its incorporation into the new development yielded a sustainable solution. Numerous schemes were initially evaluated for the ability to integrate form, structure, function, and sensitivity to the historic church. 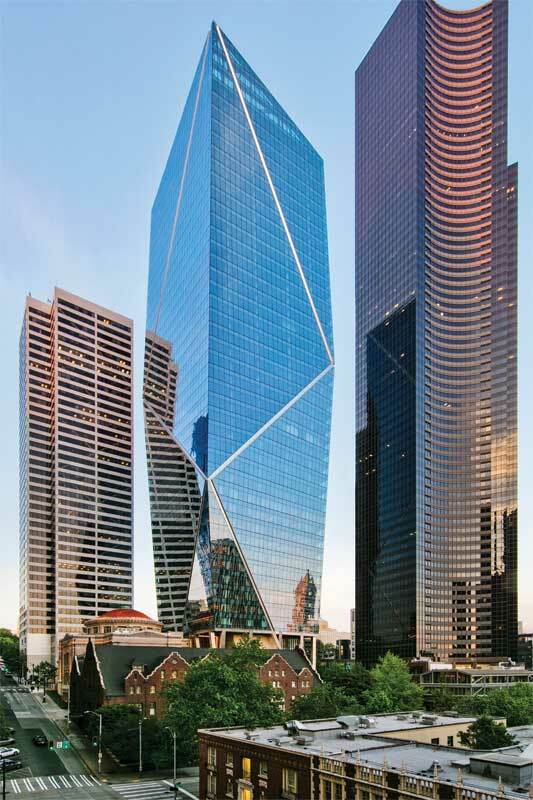 A faceted façade scheme was selected to optimize building height, configuration, and floor-plate efficiency, while responding to the owner’s vision for an iconic addition to downtown Seattle’s skyline. The 69,677-m2 (750,000-sf) high-rise is distinguished by the diagonal steel braces dividing its planes. An article in our newest sponsored e-book examines how a faceted scheme helped shift the load away from the building core and to the exterior walls, thereby eliminating view-obstructing elements like internal columns and reducing the core size to create more efficient floor plates. It appears along with two other articles from the pages of The Construction Specifier in ““Building with Steel,” a free, downloadable resource. To get your copy in either pdf or digital edition, visit www.constructionspecifier.com/ebook/new-millennium-building-with-steel-e-book.